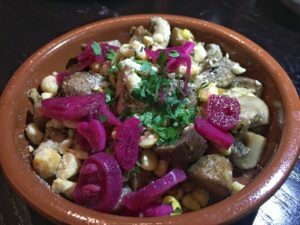 I have a pet peeve when it comes to the word “tapas.” All too often I hear people use tapas as a generic term for small plates, which actually makes me cringe. Tapas is a Spanish word referring to small savory snacks, and really shouldn’t be interchangeable in describing other cuisines that also happen to be designed for sharing. Tapas means tapas at Calle Cinco, and that’s a good thing. Calle Cinco is a pop-up from restaurateur Michael Schlow. It replaces Conosci, the creative restaurant-within-a-restaurant attached to Alta Strada in the Mt Vernon Triangle area. 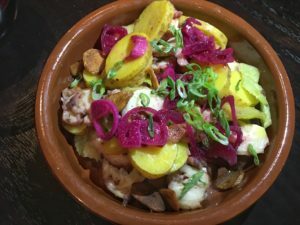 I’m hoping that Calle Cinco is a keeper, and if you’re a fan of tapas (the real thing), you should too. The Executive Chef at Calle Cinco is George Rodrigues (Tico, Conosci). Rodrigues originally honed his Spanish food skills while working with Iron Chef Jose Garces at Mercat a la Planxa in Chicago. He moved to the DC area to open Tico for Michael Schlow in 2014. His food at Calle Cinco reflects a respect for traditional Spanish tapas, executed with flair. Tapas here feature ingredient pairings that evoke fond memories of afternoon snacks and leisurely late night suppers in Spain. If you haven’t had the pleasure of visiting Spain, Calle Cinco’s bright, lively, and approachable food may have you checking airline fares. It’s a pleasure to peruse a menu that features a wide range of moderately-priced cocktails, wine, sherry, vermouth, and beer. Tempranillo rioja pairs exceptionally well with tapas, and at $40 is among the higher priced bottles available. I appreciate a restaurant that encourages you to sip wine and munch on bites of manchego cheese and assorted Spanish olives as you peruse the menu. The attentive yet laid back pacing of the service is truly reminiscent of the country that inspires the food here. The menu features a selection of 20+ tapas and pinchos (which are like tapas, but served with toothpicks). Vegetarians can create a hearty meal with crispy papas bravas topped with aioli and a savory tomato sauce, blistered shishito peppers, and “setas” a feisty combination of wild mushrooms, sweet corn, shallots, and hazelnuts. 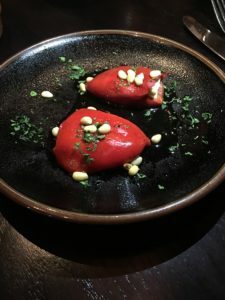 A glistening plate of piquillo peppers with whipped goat cheese, lemon zest, and pine nuts is met at our table with exclamations of delight, its bright color matching the flavor. 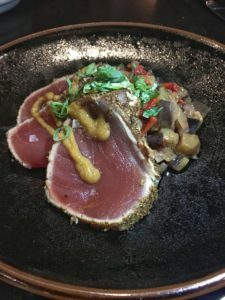 Seafood offerings include Atun, a sumptuous preparation of seared tuna with eggplant and olives accented with a smoky boquerones vinaigrette. Ensalada de pulpo is a lovely collaboration of Spanish octopus, potatoes, celery, and smoked paprika. A more even ratio between potato and octopus would enhance this dish. It’s heavy on the potatoes. The restaurant’s dark and dramatic interior is appealing, and on the two occasions I’ve dined in the space, conversations have flowed easily. No shouting required. I wish I could say this more often when I dine. Calle Cinco, like the other restaurants in the Schlow Restaurant Group, benefits from the talents of Executive Pastry Chef Alex Levin. 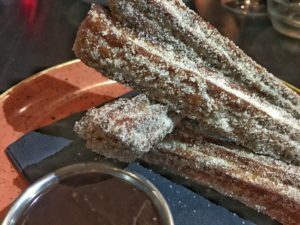 Don’t miss the exquisite warm churros dusted with cinnamon sugar and a dish of melted chocolate for dipping. 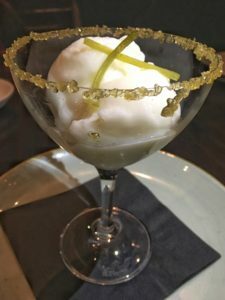 For something sweet but a little lighter, there’s a unique gin and tonic flavored sorbet. Calle Cinco may morph into another concept at any time, so catch it while you can. The plates might be small, but the food and service make for a true tapas experience. *Calle Cinco’s happy hour menu is available every day of the week from 4:00 p.m. to 6:30 p.m. featuring $5 drinks, and an assortment of cured meats, cheeses and tapas priced at $7 and under. Highlights from the menu include two kinds of “bikini sandwiches,” Serrano ham and Manchego or mushroom, Mahon and truffle, a play on a grilled cheese that’s popular in Barcelona; as well as tortilla espanola, papas bravas and pan con tomate. Special beverage promotions include $2 sangria from 4:00 – 5:00 p.m., and $2 beer from 5:00-6:30 p.m. The “Dos Amigos” provides guests who purchase two cocktails a complimentary chef’s choice tapa, and the “In your face porron challenge” rewards anyone who is able to drink a porron with a fully extended arm and no spills with a complimentary chef’s choice tapa. The piquillo peppers were really special and the desserts were awesome. Kudos to Chef Michael Schlow and Pastry Chef Alex Levin for a very successful dining experience and fabulous menu!